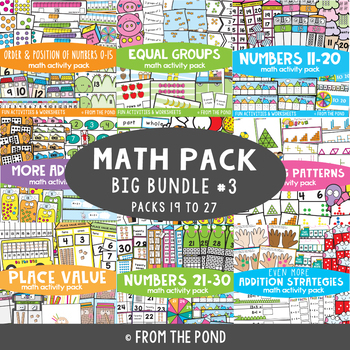 It includes 9 of my 'Math Packs' - each including 5 activities carefully designed to explore the concepts in an engaging and motivating way. 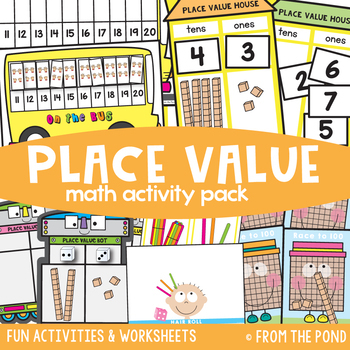 Most importantly the activities have been designed to explore the concept itself - your students will not groan about another game of 'bingo' or think they have 'seen it all before' with this collection! 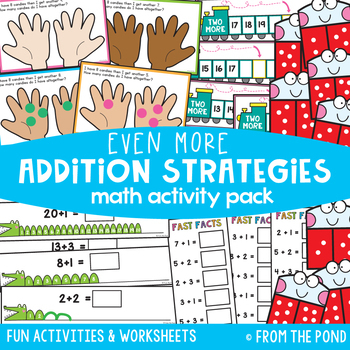 Perfect for the teacher who knows how to teach the basics, but needs fun motivating resources that are easy to prepare. Students will make a group of counters/chips that is one more or less than a given group. Students will make a cube 'train' that shows one more of less than a picture and record the numerals. Students will make forward and backward jumps on a number track of 1, 2 and 3 and determine the new landing position. Students will locate and position numbers immediately before AND immediately after a given number, randomly in the range 0-15. Students will make equal groups and describe them. Students will match pictures and descriptions of equal groups. Students will use arrays to represent equal groups. Students will act out a sharing story to show equal groups. Students will recognize numerals 11 to 20. Students will match numerals, tally marks, number names and quantities for numbers 11-20. Students will write numerals in correct stroke formation. Students will write numbers 15-20 in counting order. Students will say and write turnaround number facts for addition with numbers to 20. Students will explore skip counting and adding on two more..
Students will explore skip counting and adding on two more from both odd and even starting positions. Students will will learn to count on ‘2 more’ from the larger number. Students will identify parts of and whole shapes. Students will visualize one half of a whole. Students will place two halves together to make a whole. Students will draw a line on a picture object to divide in half. Students will identify pictures that show half and whole and match to written descriptions. Students will use pattern blocks from the classroom to make a pattern and trace it. These can be used as classroom activities, where other students copy the pattern from the cards. Students will use popsicle sticks to copy and continue the growing patterns shown on each card. Students will identify and place missing pictures in a sequence to complete a growing pattern. Students will match a number sequence that corresponds with a growing pattern picture. Students will use pictures of numbers 11-20 (finger counting pictures) to order numbers 11 to 20. Students will make 2 digit numbers with number tiles (included) and build the number using place value blocks. Students will roll 2 dice and use these to create a 2 digit number on their robot. They will then make the number using place value blocks. Students will roll a dice and add hair to their game board. They will trade ten ones for a ten and identify a 2 digit number total at the end of play. Students will recognize numerals and number words 21 to 30. Students will recognize numbers 21 to 30 from hand pictures. 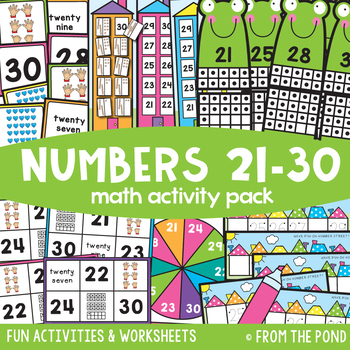 Students will recognize pictorial representation of numbers from 21 to 30. Students will match numerals and place value pictures. Students will match quantities to numerals. Students will make numbers using ten frames. Students will write numbers 21 to 30 in counting order. Students will combine 2 groups to model addition from stories. Students will model and create turnaround facts.